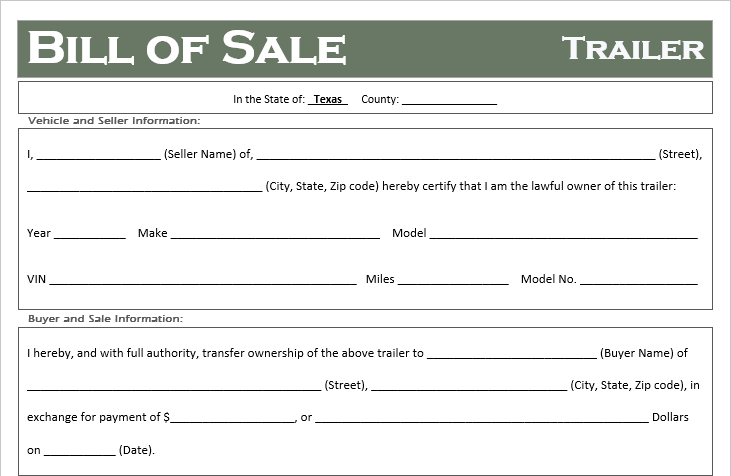 When purchasing or selling a Trailer in Texas you always want to document the transfer of vehicle from the seller to the buyer. Typically this is done by signing the “Transfer by Owner” or “Assignment” section on the rear of the original title. We also suggest securing a valid Texas bill of sale to properly document the sale including the sales price, condition of the trailer, and hold harmless language to protect the buyer and seller. 1. These vehicles can be very expensive. Whether you giving or receiving cash for an item, you want proof of the transaction in the event someone makes a claim against ownership (if you are the buyer) or if someone is injured by or on the trailer (if you are the seller). It is a simple form of insurance. 2. Your state may require the trailer be registered with the department of motor vehicles. A proper bill of sale will be necessary when applying for registration as you will need to show ownership of the trailer. If applying for vehicle registration, most states now have an online registration portal you can use in which case you will need an electronic copy of the document.